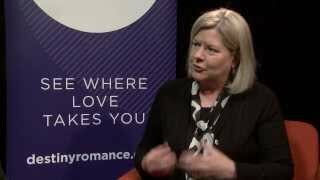 Louise Reynolds is an author of contemporary romantic fiction. Born in Sydney, she spent her childhood frolicking on beaches before moving to Melbourne at age 10. After one look at Melbourne beaches she got a library card and started to read. It was a logical step to take her love of romance novels to the next stage and tell her own stories. By day, she works in the commercial lighting industry, lighting anything from bridges to five star hotels. By night, she's working her way through a United Nations of fictional heroes. After a lifetime of kissing frogs one finally turned into a prince and she lives with her partner in Melbourne's inner north. She loves live jazz, cooking complicated meals that totally destroy the kitchen, and dining out Louise Reynolds is an author of contemporary romantic fiction. Born in Sydney, she spent her childhood frolicking on beaches before moving to Melbourne at age 10. After one look at Melbourne beaches she got a library card and started to read. It was a logical step to take her love of romance novels to the next stage and tell her own stories. After a lifetime of kissing frogs one finally turned into a prince and she lives with her partner in Melbourne's inner north. She loves live jazz, cooking complicated meals that totally destroy the kitchen, and dining out. She has embraced Melbourne by wearing far too much black. To ask Louise Reynolds questions, please sign up. This is a brilliantly warped world seen through the eyes of a drug addicted alcoholic. Mesmerising twists. Couldn't put it down. We’d love your help. Let us know what’s wrong with this preview of Miss Valentine's Love Emporium by Louise Reynolds. We’d love your help. Let us know what’s wrong with this preview of Letter from a Rake by Sasha Cottman. We’d love your help. Let us know what’s wrong with this preview of An Unsuitable Match by Sasha Cottman. We’d love your help. Let us know what’s wrong with this preview of A Scottish Duke for Christmas by Sasha Cottman.